About an year later, another man made a speech at Thai Poosa Mantapam in the bed of river Thamirabarani at Tirunelveli [on the night of 9th March 1907] and was convicted under sections 124A & 153A of Indian Penal Code by the Bench consisting of CA White & Miller. After that speech in 1908, he was arrested on charges of sedition. Mahakavi Bharathiyar and Subramanya Siva appeared in the Court in the case and VOC was sentenced to double life imprisonment tantamount to 40 years ad confined to prison. He was treated badly as a convict and subjected to inhuman torture. In law, sedition is overt conduct, such as speech and organization, that is deemed by the legal authority to tend toward insurrection against the established order. Typically, sedition is considered a subversive act, and the overt acts that may be prosecutable under sedition laws vary from one legal code to another. Sedition is the stirring up of rebellion against the government in power. As you travel down south and as the train winds its way to a small station – perhaps you might get down to free your legs, take a stroll or enjoy a cup of tea – unlikely that you will bow down to touch the land ! 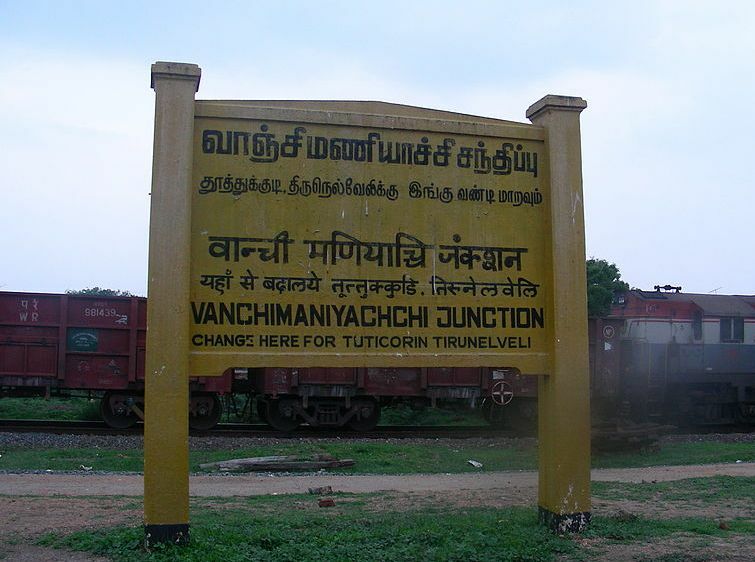 – after Madurai, it would be Virudunagar, Sattur, Kovilpatti and 624 km away from Chennai Egmore it is Maniyachi station – now named ‘Vanchi Maniyachi Junction’. 106 years back, at 10.30 in the morning pistol sounded – there was commotion as the only killing of British Official in South India occurred – few minutes later – there were sounds of pistol again – this time the martyrdom of a youth – hardly 25 years of age did the supreme sacrifice of his life for the motherland. This is not to eulogise the killing but the martyrdom needs to be extolled. Inspired by the Surat Congress in Dec 1907 the man who pioneered shipping – VO Chidambaram Pillai organised political meetings in Tuticorin and Tirunelveli. There were fiery speeches by Subramania Siva. The Freedom struggle spread and on Feb 1908, around 1000 workers struck work in the Coral Mills of Tuticorin. The collector Robert William Escourt Ashe had imposed restriction by Sec 144 and the union of workers was not to his liking. When the patriotic leaders planned to celebrate release of Bipin Chanda Pal as Swarajya day – violence was unleashed by the Dist Admn. VOC, Siva, Padmanabha Iyengar were arested in Mar 1908. There were riots in Tuticorin and Tirunelveli termed as incendiarism. Perhaps all these made Ashe. The downfall of the VOC’s Swadeshi Steam Navigation Company was also linked to Ashe. Robert Ashe had been born in 1872 in Ireland. In 1895, he arrived in India, where he began his career as an Assistant Collector and rose up to be District Magistrate and Collector. In 1907 he had his posting in Tirunelveli. For two months he officiated at Tuticorin during which period much occurred. A few years later, on 17th June 1911 - Ashe was travelling along with his wife Mary Lillian Patterson. At 10.38 the train halted at small Maniyachi, a neatly dressed man with tufted hair alongwith another in a dhoti approached the carriage and shot Ashe on the chest from point blank range with a belgian made pistol. The assailant ran towards the latrine and shot himself in the mouth. He belonged to Bharatha Matha Association. ---- and that Man of unflinching courage was Vanchinathan. He was born in 1886 to Raghupathy Iyer and Rukmani Ammal. His actual name was Shankaran. He did his schooling in Shenkottai and graduated in M.A. from Moolam Thirunal Maharaja College in Thiruvananthapuram. Even while in college, he married Ponnammal and got into a lucrative Government job. After Vanchi shot Ashe and himself, a letter was recovered which purportedly indicated that the murder was political and caused great apprehension. The timing of the assassination indicated a protest against the impending coronation. A massive manhunt followed the assassination. Sadly, it was reported that even his last rites were not performed. 14 persons were arrested and charged with conspiracy. More deaths were to follow as two committed suicide - Dharmaraja Aiyar took poison, while Venkateswara Aiyar slit his own throat. Madasamy, widely believed to be Vanchi's accomplice and who was seen running away after the assassination, was never traced. 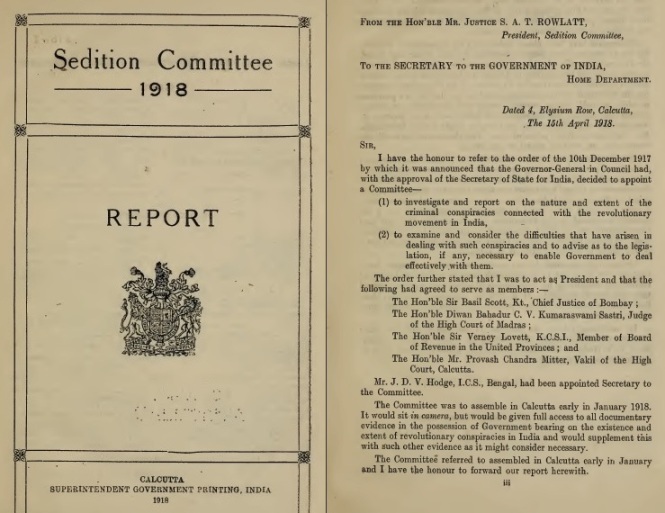 In a Court of Justice in the colonial context there were testimony of approvers who perhaps were threatened and there was panic amongst the freedom fighters as they feared strict action. What happened to the family of Veera Vanchinathan is not documented but there cannot be any doubt that his lineage would have suffered chill penury and were left uncared for – they would have been hounded by the British and after India obtained freedom, nobody ever cared for them. Indians exhibited their loyalty immediately after the killing by erecting two memorials – one at the place where Ashe was interred and another a mantap at Great Cotton Road in Tuticorin - the subscription of Rs.3002/- being raised from the Indians !!. The life history of the Great Patriot Vanchinathan is not found in any great detail in the history books and not many remember him. In his birthplace Sengottai [Shencottah] in the foothills of Western Ghats closer to Tenkasi / Courtallam, a statue was erected during the regime of CM MGR. In the movie Kappalottiya Tamizhan, Actor Balaji played the role of Vanchinathan. Long Live Bharat Mata and Long Live the Martyrs who gave everything to make us live the way that we are doing today…..